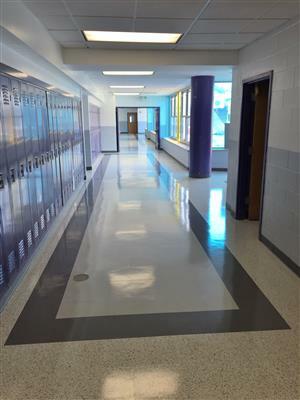 The district-wide capital program has brought a number of improvements to the middle school, including parking areas with improved drainage, upgraded electrical systems, and floor replacements. For ongoing reports, photos and details about the capital program district-wide, please visit the Capital Projects web page. Photo: A section of renovated hallway at the middle school.